Julia Roberts says “she’s speechless” about the character behind her latest role in Wonder – the mother of a boy with a rare congenital condition that has affected the way his face is formed. The film, out on Friday, is based on the bestselling novel of the same name by R J Palacio, and follows Auggie’s journey as he takes the difficult step of his first year at school. “For me, when I read the book, I thought it was so special, so incredible the way she had crafted the story about this family, and that’s really a story about all of us,” says Roberts. 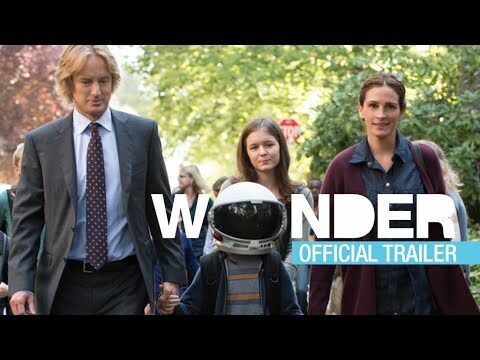 Roberts’s character, Isabel Pullman, home educates Auggie – played by 11-year-old Jacob Tremblay – until he is 10 before deciding to send him to school. “I think, for me, the one thing in Isabel that really just left me speechless was her ability as a parent to spend every minute of 10 years with this incredible boy, and wake up one day and know that against all of her mama bear instinct that the right thing to do was to send him out into the world. “To know that he was a good and funny, sweet, capable boy and could find his way in the world. And that is what he needed to do regardless of her wanting to keep him home wrapped up in cotton balls. Tremblay, who had to wear extensive make-up for the role which took two hours to apply every day, is best-known for playing Brie Larson’s son in Room, the film which won her a best actress Oscar in 2016. “I think the main message of this movie is to choose [to be] kind, but also to be true to yourself, and to just never give up,” says Tremblay. “While doing research I found a group of kids in the Sick Kids Hospital in Toronto who were affected by facial differences, and I reached out to them and I asked if they could send me any letters or experiences or tips or anything they just wanted me to know. “Later I got back all these letters, and I had them all in this binder, and I had it with me all the time on set. Tremblay explains: “I read them over and over again, and one of the letters was about the experience of being stared at, and I remember reading that letter before I did the scene where I walked into homeroom for the first time,” he says, recalling one of the film’s key moments. Roberts hopes that audiences will take the same message from the movie that she and Tremblay have. “I think the way we feel is just joyful,” she says. “It is within our grasp to be kind, to be gentle, to look beyond the surface of any and every situation a little deeper, and maybe just to slow down and take a little bit more time with each other.